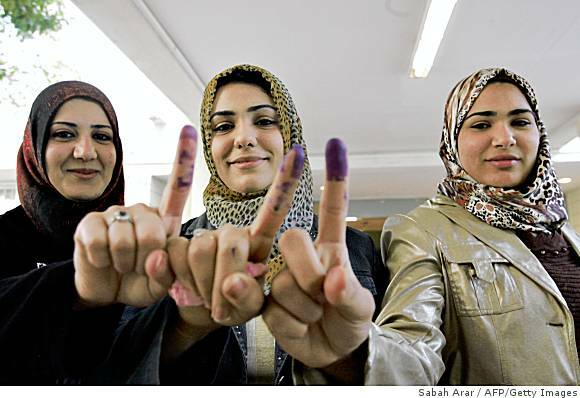 Iraq has had free elections, but has it stalled on the road to democracy? An interesting article in the New York Times this week features interviews with Iraqis who offer advice for Libyans on how to build a stable and prosperous country post-Qaddafi. Based on their own bitter experience with corruption, sectarian violence, and political gridlock, they highlight mistakes to avoid in the transition from a repressive dictatorship to an accountable, representative government. Not surprisingly, these Iraqis reiterated the now widely accepted lesson that the U.S. decision to pursue aggressive de-Baathification (removing members of Hussein’s Baathist regime from government positions) was counterproductive, stoking tensions and preventing capable officials from assuming key roles. They urged Libyans not to repeat this mistake in dealing with former regime officials. Political scientists have distinguished between democratic institutions, which include checks on executive authority and free elections, and democratic norms, the more intangible values of tolerance and compromise that undergird these institutions but take much longer to develop a foothold in society. What these weary Iraqis clearly recognize is that the institutions of democracy are nominally present but the norms are sorely lacking, which erodes the stability and legitimacy of those institutions. The conclusions drawn by these ordinary Iraqis are sobering for the future of Iraqi democracy. “The parliamentary system in Iraq has failed,” said Thaar Abdul Kadhum, 34, a contractor. “They should have a president who can make all the decisions, and not have all these blocs like we have now.” Many Iraqis are tired of “the chaos of Iraqi-style democracy. Increasingly, they want a strong hand — elected by the people — to wield power.” This raises the specter of illiberal democracy, a system that combines free elections with a lack of basic civil liberties and checks on governmental authority. Democratic transitions often get “stuck” in this hybrid stage, as Vladimir Putin’s Russia and Hugo Chavez’s Venezuela attest. Can Iraq and Libya escape this fate? This entry was posted in Uncategorized and tagged democracy, illiberal democracy, institutions, Iraq, Libya, norms. Bookmark the permalink.